I was about to post last night but I met some friends to write them a scenario for their date. My friends are not pretty like me but want to have a date. We learn our dating skills through words. Few months ago I was watching a Korean movie called ‘Cyrano Agency’ and from that movie it reminded me of my high school days. I liked to invent a fake date for my friends. I made a scenario, which was more detailed than a movie. Some of the scenarios are still at my house. It is very funny but I feel too shy to reveal it to you guys. If you read too much about psychology during your teens you might turn out to be like. During the peak of the puberty time there might be some side effects. That is my rule in writing..! I try to connect two people and of course if there is any competition I eliminate them. I don't listen to any dating problems. That is their problem that I can’t interfere. Also if they need some back cover I could become one. I tried doing 3 different people in 1 voice. If you follow the scenario, I take responsibility to make it 100% until relationship develops. Some friends can’t take in the scenario so have to give up. If I ask for the cost it is the trust between us. If I need them for my own relationship I ask for their alibi or some actresses needed for the fake scene. I can’t get rid off my past writing skills so even until now I am doing a favor from my friends. Opps. I went to far now. I should stop here. The nail polishes that I purchased in Hong Kong. It is hard to do a review on the nail polishes that I bought in Hong Kong so this is only some of it. I have to do hair posting, another different makeup review, and more. All of them were 4.5ml mini size and the price is less than 1,000won in Hong Kong. The products are inexpensive. It is Made in France that is exported to United States and around Asia. Even me I didn’t know about the brand. If it was made in China I bought about two or so but it was made in France so I bought these many. I have said that I didn’t like the glitter that much but I think I am getting old.. I let myself go when I see glitters and my heart starts to pump faster than normal. There were so many colors than these but I only picked polishes that have glitters on them. I have bought all kinds of glitters per color. On the right side, there are no glitters but I just bought the purple color because it was pretty. I didn’t buy them to paint my nails with only one color but I would like to mix them according to the occasion. I want to present in various way with the colors. There is no need to describe; you could see it from the picture. As you can see almost all of them are glitters. Glitter, shimmer, frost and pearl. The difference between glitter and shimmer is that.. When the particles are really shining and have thick sparkles are called glitter. There are many tiny sparkles that is hard to spot them is called shimmer. Also for frost and pearl it have really tiny shimmer that can’t be really founded individually and looks like frosting in the winter. So understand by large, medium, and small glitters. It is hard for the people to differentiate, as there are many similar polishes that doesn’t have big difference with each other. When you look at this picture, you could tell difference right? When you use a glitter polish in a wrong way it might look rustic or too much. However when you use it well it could look like a fashionable jewelry item. Most of the Koreans like soft pastel color so when sometimes they paint it with bright colors, they might feel uncomfortable. So most of the Korean polishes are not into producing fancy nail polishes. It is really hard to find a glitter in the department stores that would captivate my eyes. The white cover is MARCIA. It’s very cute and like the mini size. It is really hard to finish any nail color maybe except black and red polishes. It is nearly impossible to use the whole bottle of nail color aside from the base and top coat. So when I buy the original size, I paint my friends nail. I hope there are more mini polishes for even the price is cheap. I don’t have much word for the products. It’s just a glitter polish. The size of the glitter is different from each other. On the second picture, the purple color on the right side is really hard to find. So when you see like this color just bring it with you. The third picture is a shimmer and frost pearl type that could be pretty with only using one color. Well.. even glitter well just do with several of coats. Smaller the glitter it should apply many coats. Same for this polish divides with glitter/shimmer/frost and pearl. The price of this nail polish was really inexpensive. This kind of price is hard to found in Korea only in sale products that you can’t even know where it came from. I have really bought this polish because of the inexpensive price but some of the polishes are above expectation. I guess you have understood the difference between those glitters. When you look in close up it is these colors. Contains enough mixed amount of reddish purple glitter. I won’t show you application of the color because even though you like this I don’t think you can purchase it so easily in Korea. There is not much to learn about for just painting the nail polish. However doing other nail posting, I will use these nail polishes. The polishes that are similar to Korean brand nail color. Today’s high light is the Major Point Symbol. The colors ready pilling off and can’t really see the glitters. Deborah Lippman Nail Color…! I painted only one coat so most of them are gone. I can’t erase it even though it has past 10 days. I can’t bear to look as they are going away. I have found this picture from yahoo.com so if they tell me erase it I have to. I have state my URL. On the way to the airport I stopped at a IFC mall and I found something really nice. As you can see from the picture, the transparent glass case was different from others. I was going crazy for the clothes and other present for my friends so I didn’t get to pat attention to my own things. I told myself I would come back for it but I forgot and went straight to the airport and rode a plane. I was in a shock as I remember the polish as I was eating my lunch in the plane…..
My sister is really strict so she doesn’t wear hot pink nail color. I have to force her to wear it or when we go out of the country. Even our mom says to do so she would never. The picture of the polish on the nail wasn’t pretty but many said I like this nail polish so I hear to talk about it. 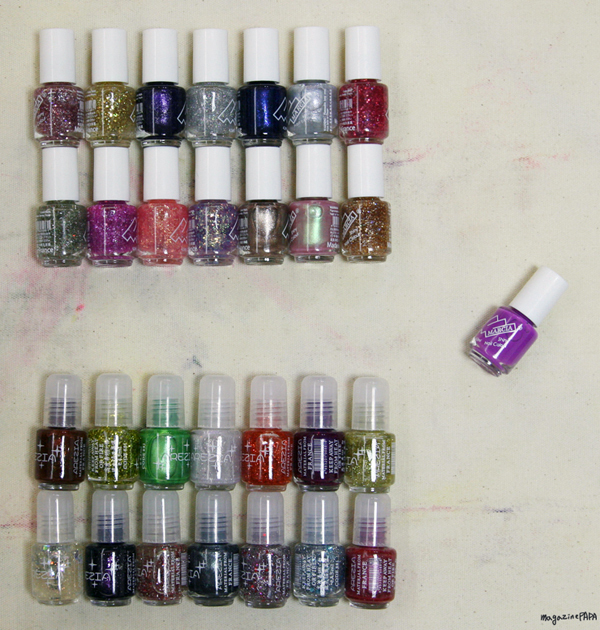 Roughly these are the colors found in the polish. That is why it is fancy. When you look at it the size of the glitter seems similar but when you actually wear them they aren’t. I didn't know the brand name or heard about in Hong Kong I was busy testing out for the products. I was regretting of not able to purchase the nail polish. So I was telling someone that I think I need to go back and get it but she said she will try to make it by herself with mixing some glitters together. She told me the name of the polish saying its Deborah Lippmann, Happy Birthday? So I got to know the name of the polish. I was looking through yahoo to see if it is the right polish because I know how it looks like. Finally it was the product that I was looking for. Thank you so much for telling me the name!! On the days when I didn’t know about the export cosmetics even my friend who lived the United States for 8 years didn’t know about this product. I hope I got some information on this so I can’t be calm down and have to come home to search for the information. So I just came home after drinking cup of tea. This is the picture taken by applying only this product. I have used variety of nail pictures from long to short nails to make you understand how it appears. The top two pictures are 2 coats and pictures at the bottom is 3~4 layers. The size of the glitter is diverse but for this polish you have to have apply several times. It is hard to apply evenly with few touches of glitter only. Well~ does it only me this who thinks this nail polish is pretty? This polish can be used during any four seasons with adding fantastic colors. On the information that I found is that this polish is made from manicurist Deborah Lippmann. Many Hollywood celebrities uses this polish and the price is much higher than OPI so it is not really publically known. But can be found in some departments. I didn’t really got some information but I know that this color is favored by many people. This is the real color that is favored by women on the States. Personally I don’t think layering is pretty with this polish. Applying ivory/beige for the base color will be better as like the feet picture. Single would be better for the whole fingernails but giving a layering for a point would pretty. I haven’t tried it out yet but just an idea. The price isn’t cheap but I think I have to bring it with me. I am looking for friends who can do me a favor who can buy and send this product to me. There was a same glitter polish that I bought in the mini size with white cover on top. The size are different but the contain of color are the same (silver/red/green/blue/yellow). The image is different comparing to the Deborah’s polish. The size is 3 times small and price is 20times cheaper. I have mixed the eye shadow powder that is found in MAC pigment. 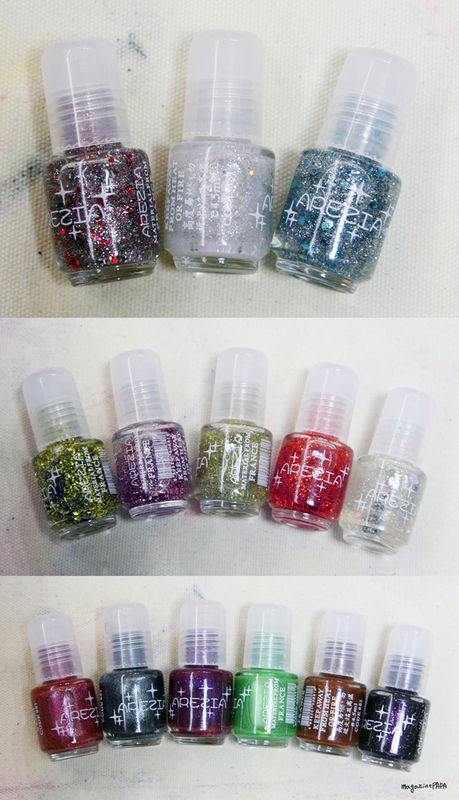 I mixed with clear nail polish with pigments to make a nail polish. The reason why I can’t apply smoothly is that the blending done with a machine actually however I use a spatula to do the mixing and did it quickly not releasing the air all the way. There was no nailbrush to do the mixing so the color didn’t mixed well together. However, collecting some tools and being prepared, it be possible to make an only color found in the world doing 3 time of experiments. I will make my own color and wear them. Well, I don't have that much time to do so. For Mac and NYX the pigment are already fixed as it is so like in the picture, the color comes out to be shimmer and frost pearl. When it goes like this, it will create a much work to do.